The content of this article provides interesting history, facts and information about Gladiator Schools. Gladiatorial schools "Ludi Gladiatorium". The gladiator schools also served as barracks, or in some cases prisons, for gladiators between their fights. It has been estimated that there were more than 100 gladiator schools (ludus pl. ludi) throughout the empire. New Gladiators were formed into troupes called 'Familia gladiatorium' which were under the overall control of a manager (lanista) who recruited, arranged for training and made the decisions of where and when the gladiators fought. The name troupe (familia) would normally be followed by the name of their owner e.g. Famalia Batiatus. The staff of the lanista which looked after the gladiatorial school (ludus) were called the familia gladiatoria. The Lanista could hire out the gladiators to ensure the success of a particular gladiatorial games. Wealthy Romans invested in the troupes of gladiators. Gladiator schools emerged providing excellent training in weapons and combat techniques. New Gladiators were at first conscripted to the gladiator schools from slaves, criminals and prisoners of war. They were forced into the roles of gladiators. Some were sentenced 'damnati ad gladium' meaning death by sword. They were condemned to death either by execution by sword or to fight until dead as a gladiator. By the time of the Roman Empire all this changed. Free men started to enrol as new gladiators. Some were ex-soldiers, some wealthy Romans wanted the adulation and the glory and some needed money to pay off their debts. Gladiators were allowed to keep any prizes or gifts they were given during gladiatorial games, so if a man became a successful gladiator, it could prove to be highly lucrative. These free, new gladiators who sold themselves to gladiator schools for money were called Auctorati. 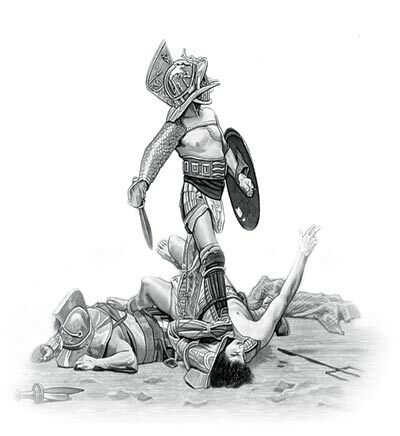 Prospective gladiators (novicius) had to swear an oath (sacramentum gladiatorium) and enter a legal agreement (auctoramentum) agreeing to submit to beating, burning, and death by the sword if they did not perform as required . When a new recruit (novicius) entered one of the gladiators schools he was assessed by the lanista, a doctor and the trainers. He would be checked by a medici (a doctor, not to be confused with the doctores) for any medical problems and whether he was physically suitable to train as a gladiator and equipped to withstand the rigours of training and combat. Any unattractive men would be discounted - the spectators liked good looking gladiators. Their physique would be assessed and a decision made as to what type of gladiator he would be trained as. Would he be suited to wearing heavy armor or would light armor be preferable. Once the lanista and the trainers of the school had made the decision then this was how they would be trained (see Types of Gladiators). The Gladiator trainers who worked in the school, often retired gladiators, specialised in specific styles of fighting and weapons. The trainers were called Doctores. A Doctor who trained the types of gladiator called a Retiarius would be called Doctores Retiarii or one who trained Secutores, Doctores secutorum. When men were accepted into the gladiator schools they were first referred to as novicius and when they had completed their initial training and were ready to fight in the arena they were called Tirones gladiatores or Tiro. A gladiator fighting in his very first public combat was therefore referred to as a Tiro. The Tirones often had tattoos (stigma, from where the English word stigmatised derives) applied as an identifying mark on the face, legs and hands. The practice of tattooing the faces of gladiators was eventually banned by the Emperor Constantine in AD 325. The regime of the gladiators was harsh, gladiators had to train everyday. They trained continuously to gain the highest of skill levels Gladiator Training. But they were well fed by Roman standards and they received excellent medical treatments. New recruits were closely guarded and were put in shackles, although this type of treatment eased with time served. However, the Life of a Gladiator was not all bad. These highly trained gladiators were an expensive commodity and as such they were treated with some care. Most gladiators were only expected to fight 3 - 5 times a year. Gladiators were paid each time they fought. They were allowed to keep any rewards and purses of money. The most successful were also treated like modern day 'Pop Idols'. Bonds between gladiators were formed in the gladiator schools, despite the fact that they might be called upon to kill each other. These trained gladiators also joined formal associations, called collegia, to ensure that they were provided with proper burials and that compensation was given to their families. The content of this Gladiator Schools category on life in Ancient Rome provides free educational details, facts and information for reference and research for schools, colleges and homework. Refer to the Colosseum Sitemap for a comprehensive search on interesting different categories containing the history, facts and information about Ancient Rome. Just like the subject of Gladiator Schools there is hardly a page of Roman history and the Romans that is not, on some way, connected to the Roman Colosseum which became a symbol of Rome, its society, culture and life.